Time has flown by this year, and we have reached the last day of December. A new year will be starting tomorrow, bringing with it new chances and opportunities, and new things to do, see and learn. I wish you all a happy and healthy 2015! 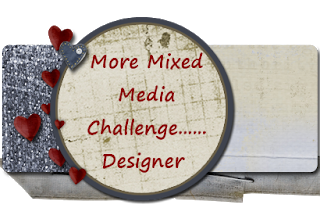 Today is also the last day of our collage challenge at Art Journal Journey. 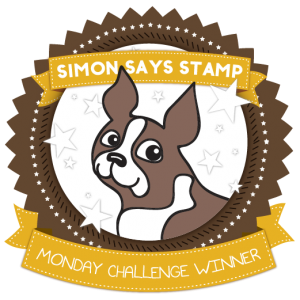 We have had more than 200 entries this month, which made me very happy, and I enjoyed visiting lots of blogs and seeing so many different interpretations of the theme. 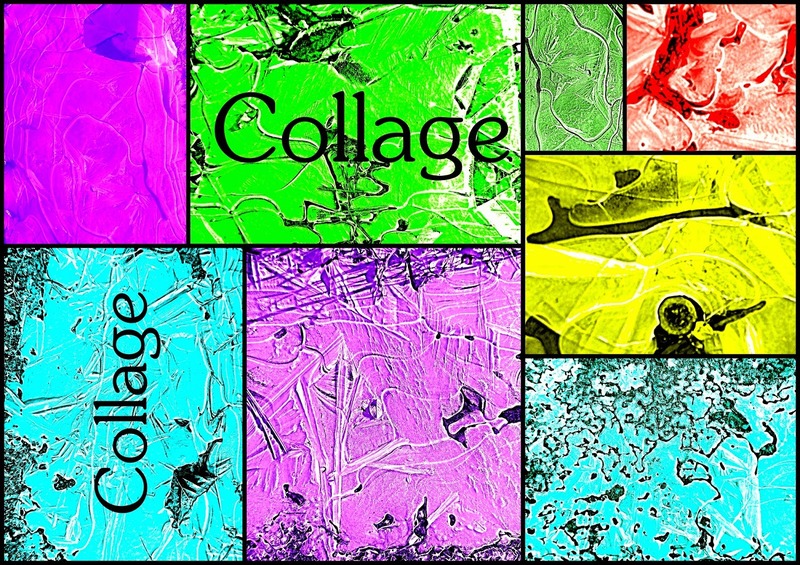 Today I am showing a collage of my collages made this last month, and I had a lot of fun making them. I want to say thank you to Diane for the beautiful cards and gifts she sent me for my birthday and Christmas, and for being such a good friend through the year. 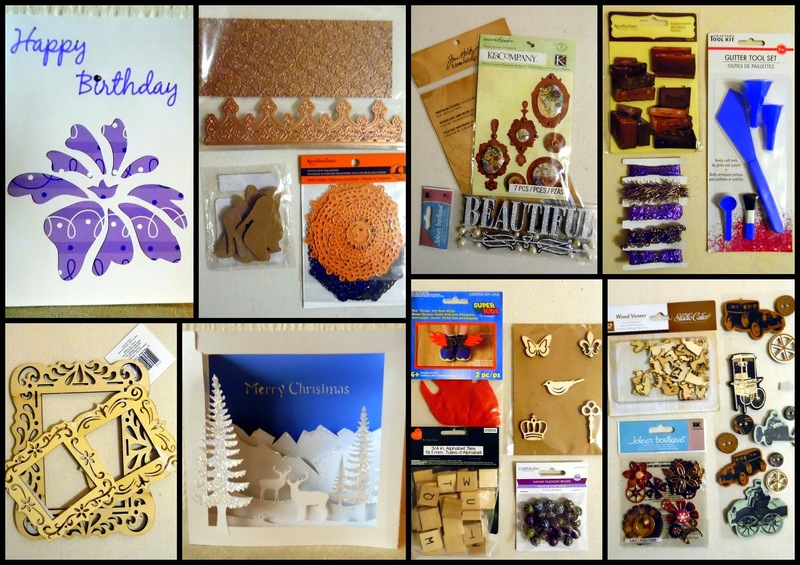 And I have made another collage to show all my lovely gifts. And in addition I found fleecy leggings and ear-warmers in my parcel to keep me warm on cold days like today. Diane's Christmas card is also something very special, made like a shadow box, but which can be folded flat to send - just stunning! Thanks a lot, Sweetie! This view always reminds me of Narnia! The jay is very hard to 'catch' as he never keeps still! Here's hoping that the New Year will bring us health, happiness and peace. See you again in 2015! 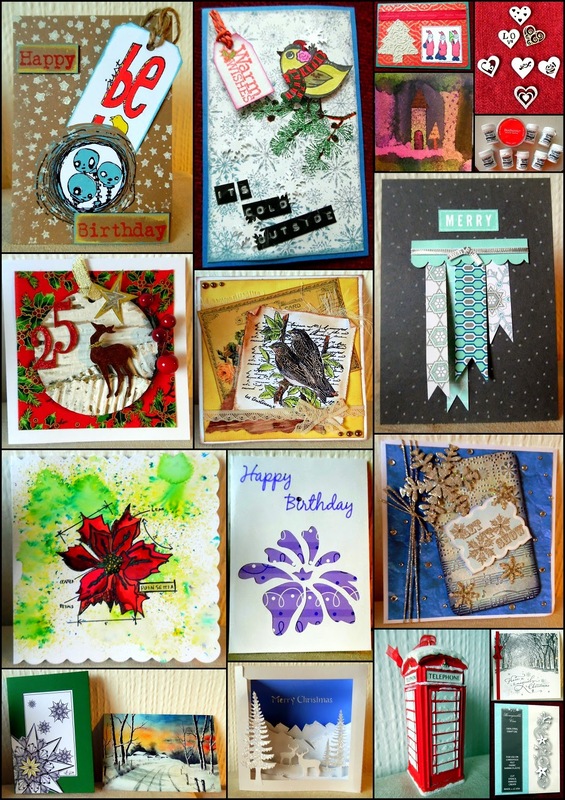 Collage, birds, snow, cards and presents. but enough to enjoy crunching through it on my walks. I wonder what tomorrow will bring? Yesterday I asked who knew what I had photographed for my 'stained-glass' collage, and three people got the answer right - Chrissie, Ulrike and Joanna - it was the ice on puddles. For Art Journal Journey I have another collage for my giant journal. The background was painted with black gesso. I added paper scraps, some fabric patterns from an ancient Sears and Roebuck catalogue, some washi tape and birds. The birds are collaged, too. I collaged and gessoed a piece of paper with printed and written scraps, and then cut /punched the birds from it,;the little flower, too. The alphas were also leftovers from other projects. I think it's reminiscent of the scenes on my balcony every morning! 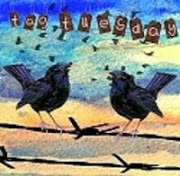 I will show my tag for Tag Tuesday tomorrow so this post does not get even longer! I want to take the opportunity to say 'thank you to those who sent me cards and presents for my birthday and Christmas. The first collage here shows the contents of the wonderful parcel from Chrissie. The tidy with the owl will be hung next to my crafting table. 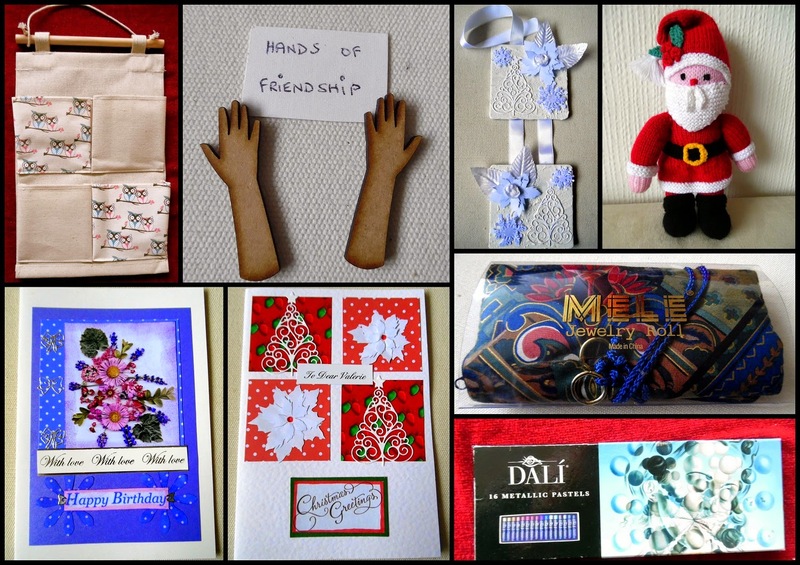 I loved the idea of the hands of friendship, and the other lovely projects she made. The hand-knitted Santa has already made friends with my reindeer and bears. Both of the cards are beautiful, as is the white on white hanger, which is now in my bedroom. The Dalí oil pastels are metallic, and have such a lovely sheen! Thanks a lot Chrissie! Here are more cards and presents. Thanks to all the lovely ladies who made these wonderful cards! Top row: Sue the Iron, Dagmar, Silvia,Sheila. The hearts came from Yvonne, and the Brushos and a little tower of Pan pastels from Sue the Iron. Second row: Suze (who also sent chocolate and Horlicks which unfortunately didn't survive till the photo appointment) Yvonne, Sue the Iron. Third row: Yvonne, Diane, Rita. Bottom row: Lonetta, Diane, Suze, Carolyn and Yvonne. Thanks everybody, I very much appreciated all your works of art and the lovely presents! 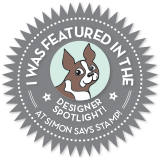 I will show more tomorrow! The winter sky was very impressive. The weather is keeping us on our toes! After snowstorms yesterday we had a sunny, but icy day today, which was once again good weather for being out and about, well wrapped up with lots of warm clothes. 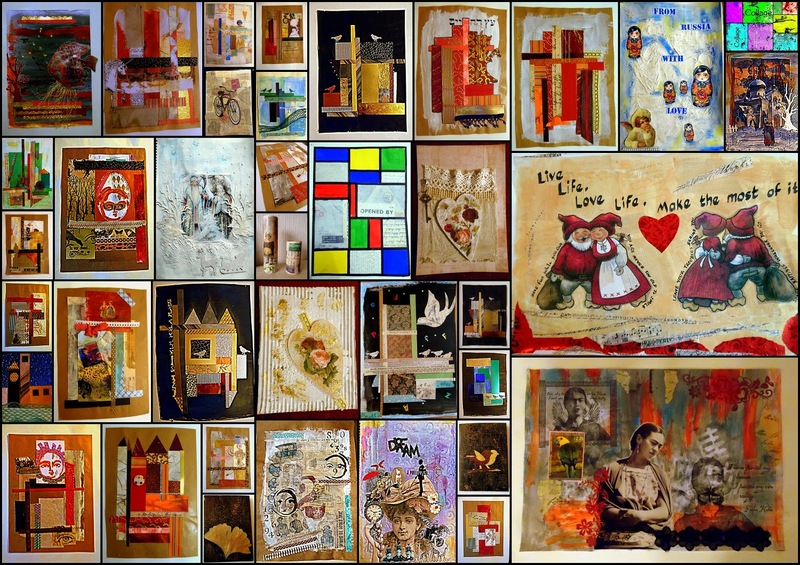 For Art Journal Journey I have 2 collages today, a 'real' one and a digital one. The first one was made with a brush wipe sheet (A3) which had lots of yellow, white and some ink spots on it. I got a wonderful present of some brushos and pan pastels - more about them in tomorrow's post'- and used the red pan pastels and some stencils here. The head is one of 'my'heads, which I have in various sizes. Actually I only have one head, and it's size does not vary, I am just talking of my head stencils. The other 2 stencils are both from Stencilry.org. The sentiment has been computer generated, also coloured with pan pastels in red and yellow, and collaged. The second collage has been made from a series of photos I took this morning, digitally enhanced and coloured, and then put together to make a 'stained glass window'. Can you guess what I photographed? This afternoon I was out and about again, and was invited to wonderful, freshly baked waffles with hot cherries, cream and coffee - yummy! Hope you all enjoyed your weekend! 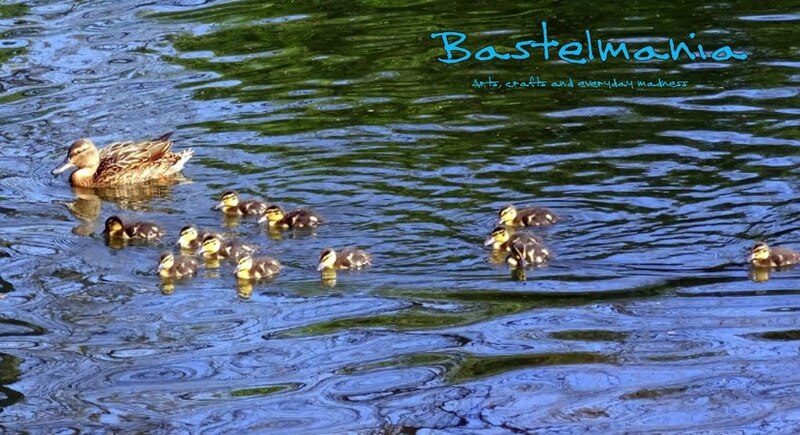 Have a good start in the week, and make the best of the last days of the year! Look after yourselves, and thanks a lot for coming by! Collage with memories of cake and chocolate. I was woken early this morning by the wind blowing hail and sleet against the window-panes, and it snowed and stormed most of the day. I am so glad I managed that wonderful walk yesterday, today it would not have been possible! On Christmas day I went to a friend's for coffee and cake, and not only was it all delicious, but we had the most beautiful paper napkins. I took mine home with me, and used it for my collage for Art Journal Journey today. The background (A3) has been made with torn papers, printed and hand-written, and then painted with gesso. I collaged the images from the napkin using mod-podge. I mixed some yellowy-beige paint for the background, and then added some scraps of washi tape. The shiny red paper along the bottom edge was the wrapping paper from a bar of Galaxy which Suze kindly sent me, (thanks again!) along with other little presents which I will show in due time. This was a fun collage, with lots of old memories hidden in the background, and new and delicious memories at the front! These photos were also taken yesterday when the weather was so nice. Little dolls and big birds. Lots of this and that. Collage, winter sunshine and birds.